Travel in a group in your private air-conditioned Coach with one of our Local Certified tour guides and receive a wealth of knowledge about Bermuda in this specially designed tour. Your first stop will be at the Gibb’s Hill Light House This stop will give you stunning views of Bermuda. Next you will then go to the City of Hamilton. There you can do a little shopping and explore the City. You will then get a chance to walk on a pinkish sand beach at Warwick Long Bay and have a few minutes to feel the surf running over your feet if you choose, or you can take some awe-inspiring photos. You will get an opportunity to take photos of Horseshoe Bay Beach and Jobson’s Cove before you had back to your ship. Your Activity will start at Dockyard, Kings Wharf/Heritage Wharf. Please be out on the pier 20min before tour departs to ensure an on-time departure. One of our Titan Tour reps will meet you directly outside of the cruise ship terminal holding a Titan Tours sign and they will be wearing bright orange polo shirts. If for some reason you don’t see us, just ask the Transport Coordinators for help. Do not leave the pier area. Tour departs within walking distance of the cruise port. When your cruise ship docks join us to get a touch of Bermuda. 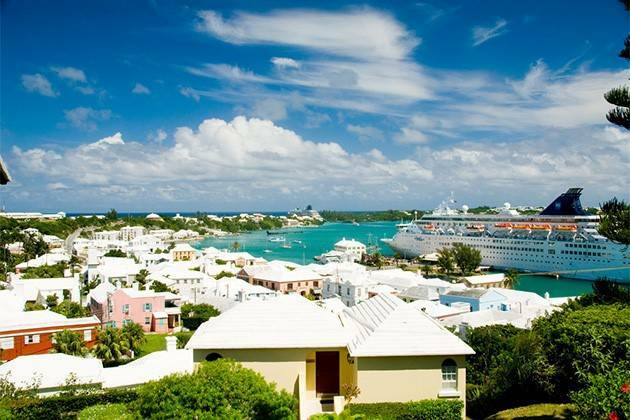 Travel in a group in your private air-conditioned Coach with one of our Local Certified tour guides and receive a wealth of knowledge about Bermuda in this specially designed tour. Your first stop will be at the Gibb’s Hill Light House which is a 117-foot lighthouse was built in 1846 of cast iron – the oldest of its kind in the world, and one of only two cast-iron lighthouses still in existence. This stop will give you stunning views of Bermuda. It overlooks the South Shore and Little Sound, offering views of both the City of Hamilton and the Royal Naval Dockyard. There is a little gift shop located at the base of the lighthouse where you can purchase a few trinkets and a quick snack. There are also restrooms located there. Next you will then go to the City of Hamilton for 40 minutes which is the capital of Bermuda. There you can do a little shopping and explore the City. You will then travel primarily along the south shore coast line and will learn some very interesting things about Beautiful Bermuda. You will then get a chance to walk on a pinkish sand beach at Warwick Long Bay and have a few minutes to feel the surf running over your feet if you choose, or you can take some awe-inspiring photos. You will get an opportunity to take photos of Horseshoe Bay Beach and Jobson’s Cove before you had back to your ship. This excursion is yours to enjoy and will last approx. 3 hours.